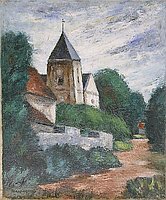 Image is of a church in rural France. A dirt pathway leads past the church at lower right, through the trees that surround the buildings. A smaller structure appears in the background at right. The church is separated from the path by a stone wall, at left, and has a slim steeple and gray roof. The other structures have red roofs. The sky is cloudy and white with hints of blue.